Reduced Roman copy of Greek bronze statue by Eutychides ca 300 B.C. 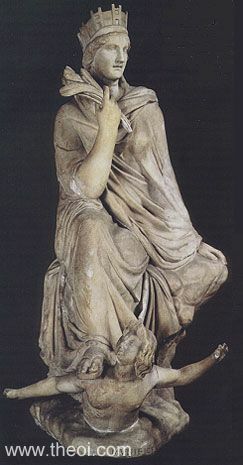 The goddess Tyche (Roman Fortuna) sits upon the back of the swimming river-god Orontes. She wears a turret-crown, representing the walls of a city, and holds a sheaf of wheat.